With the best will in the world and no matter how much time and energy you want to put in to the tiles and grout in your home to maintain their original beauty, somehow they never quite look the same some years (or even months) after they have been laid. Grout especially - since its object is to be filler for tiles (it being a very thin, coarse mortar that was originally poured into the narrow cavities between the tiles as a filler and a way of consolidating them) - tends to look especially dirty after some time. Even if the tiles are not too difficult to maintain on some basic level of cleanliness, the grout will always hold you back. So that is why it is worth - once in a while - calling in the experts to do it for you. With Oakland Grout cleaning service, we specialize in just that. Remember though: you should not have to get your tiles cleaned too often. If a company is recommending a regular tile and grout cleaning, start getting suspicious. Because at UCM Services Oakland we recommend that tiles and grout are only cleaned once in a while. And if they are cleaned well, then that is all you should need to be able to maintain your ceramic tiles easily. So don't buy in to a company recommending more than that. No matter where your tiles are - on the floor, wall or countertop - they get dirty. So Oakland Grout Cleaning Service removes the loose dirt using top of the line vacuuming methods. Then we use the best pH neutral cleaning materials which have been especially formulated for tiles and grout. The surfaces are then rinsed off a number of times to ensure no cleaning materials remain on your tiles or grout. And remember: the professionals who come from Oakland Carpet Cleaning Service do not believe a job is finished when the tiles and grout have been expertly cleaned; we ensure the whole area we have taken care of is 100% clean and dry so that you will not be exposed to any of our cleaning products. 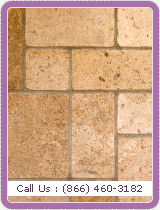 So call Oakland Grout Cleaning Service for a free estimate today!